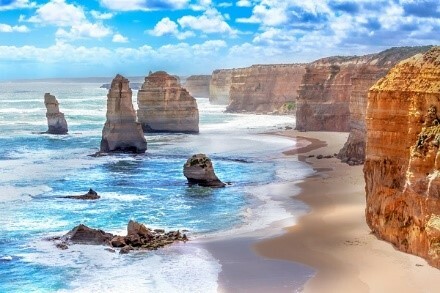 Easter is one of the best times of the year to visit the Great Ocean Road as it tends to be a bit less busy than during the summer period and it is generally sunny, and not too chilly to enjoy the many outdoor attractions. The epic coastal drive along the Great Ocean Road promises spellbinding views of jaw-dropping limestone cliffs, seemingly endless stretches of white sand and deep blue ocean. This area is bursting with natural phenomena, from the 12 million year old limestone rock stacks known as the Twelve Apostles to the towering Eucalypts found in Otway National Park, which are among some of the tallest trees in the world. The Yarra Valley is renowned for its world-class wines and seasonal produce, but it is a region which is also blessed with alluring landscapes, from rolling hills covered with vines to peaceful fern gullies and green pastures. Immerse yourself in nature and true-blue Aussie culture as you take Australia’s most popular steam train ride, tour through the Yarra Valley’s heavenly hills and meet some endearing Australian wildlife at Healesville Sanctuary. The Yarra Valley, Puffing Billy and Healesville Day Tour also includes a breathtaking bird encounter at Grants Reserve, where you will enjoy an Aussie billy tea of vegemite crackers and delicious lamingtons. If your kids or grandkids love the animated ‘Happy Feet’ movies they will be dancing with joy when they witness the magic of little penguins emerging from the ocean at sundown and waddling home to their burrows. The little penguins aren’t the only Aussie animals you’ll see and learn about on the exciting Phillip Island Day Trip. Get a selfie with a koala, feed a kangaroo or chat to a parrot at Maru Koala and Animal Park where you will find a vast array of native Australian wildlife species. Your day on Phillip Island also includes a visit to The Nobbies and Seal Rocks, where you can stroll along the boardwalk and take in the captivating coast.